I’m heading back into TNA territory for my next review, but not to the Impact Zone. Instead we’re heading to their old home in Nashville as we take a look at their latest two disc DVD release. 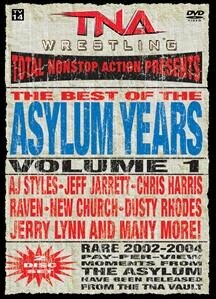 The Best Of The Asylum Years Volume 1. July 2002: The first man event held at the Asylum as Sabu challenged Ken Shamrock for the NWA World title in a ladder versus submission match. Yep, it’s one of those crazy mixed stipulation matches which can be won by either submission or by grabbing the belt from above the ring. It takes a while to get going and doesn’t really pick up speed until they start brawling up the aisle. Sabu gets busted open twice over after he somersaults through a table. There was a bit of a screwy ending to this one though. As Shamrock was at the top of the ladder, about to grab the belt, Malice ran down and choke slammed him, before taking the belt himself. Well, it was what it was. August 2002: Another ladder match, as Jerry Lynn and A.J. Styles challenged Low Ki for the X Division title. Now this was more like it. These three were made for the X Division and put in a great showing as they put their bodies on the line, taking big bumps on the various ladders and around the ring. It was great to watch. Lynn emerged victorious here, pushing Styles off a ladder onto the floor before taking out Ki with a cradle pile driver from another ladder before claiming the belt as his own. April 2003: Raven, accompanied by Julio Dinero and Alexis Laree, aka Mickie James, challenged Jeff Jarrett for the NWA World title. At the time this was the most anticipated match in TNA’s short history, so much so that they had to turn fans away. It began with Raven matching Jarrett hold for hold before turning into the brawling style, with Jarrett having to battle the Gathering before the referee sent them away. We then got one of those ridiculously over-booked finishes after the referee took a snooze, with members of Sports Entertainment Xtreme, the New Church, the ECW group Extreme Revolution and Sabu getting involved. And after all that Jarrett countered a second Raven effect with the stroke to get the title retaining pin. Well, the action was good, but did it really need all of those others involved? May 2003: The first tag team match of the collection, with the Triple X team of Elix Skipper and Low Ki facing A.J. Styles and D-Lo Brown. A good match here, with Styles and Brown putting in some good team work, although Skipper and Ki looked more fluid when they doubled up. Brown and Styles took home the win, taking out Ki with a spiked sit down power bomb just as he was about to attack Styles in the corner. June 2003: Three-way action, with Raven and A.J. Styles challenging Jeff Jarrett for the NWA World title. These three were the best in the company at the time, with Jarrett and Raven the veterans of the piece and Styles emerging from the X Division onto the main event scene. This was a really enjoyable match, with good performances from all three men, especially when Styles and Jarrett were doubling up on Raven. Then came the inevitable interference. First Shane Douglas appeared and dragged Raven out of the ring, taking him through the crowd, putting him through a table before pushing him into the car park. Then, as the referee was taking a snooze, everyone’s favourite scribe Vince Russo came to the ring and clobbered Jarrett with a guitar. A Styles clash later and the referee recovered in time to see Styles pinning Jarrett for the title winning pin. June 2003: America’s Most Wanted, Chris Harris and James Storm, challenge Triple X, Christopher Daniels and Elix Skipper, for the NWA World Tag Team titles in TNA’s first ever cage match. Of course, these two teams will be remembered for that extraordinary six sides of steel match, the one where Skipper walked along the top of the cage. This was a great match with three of the four participants wearing the crimson mask after they were rammed into the cage. The two big bumps from AMW involved Chris Harris. First, he power bombed Skipper off the top rope as he was climbing the cage. The second came when he speared Daniels while both were on the top rope. But Skipper topped both of them when he took Harris down with a body block off the top of the cage. That wasn’t the last of the big moves though. After Harris threw Skipper over the top of the cage, eliminating him from the matching and stopping him from re-entering. They took Daniels out with their death sentence finisher. But that wasn’t enough. As Storm held Daniels in position Harris came off the top of the cage for a second death sentence, with Storm getting the pin and winning the titles for his team. September 2003: A battle of former ECW Champions as Shane Douglas, accompanied by Father James Mitchell, faced Raven in a hair versus hair match. This was actually one of the first TNA matches I remember watching when it was shown in the early days of the now-defunct Wrestling Channel six months later. If you’re looking for a technical masterpiece then this isn’t the match for you. This is an all-out brawl which sees both men fighting through the crowd, with Raven getting fans to hold chairs so he can ram Douglas’ head into them. In fact the match was so physical that Douglas ended up puking at one point. Of course there’s outside interference from Slash and Synn while the referee is getting forty winks, until Julio Dinero and C.M. Punk run them off. But then, after Raven was about to get the win after taking Douglas out with a DDT through a table the lights went out, and when they came back on Vampira appeared in the ring. He took Raven down with a DDT, and the deal was done, with Mitchell shaving Raven’s head, and Douglas holding a mirror in front of him and gloating. November 2003: Another interesting tag team affair, with Sting and A.J. Styles against Jeff Jarrett and Lex Luger. Lots of jaw jacking at the beginning of this one as Jarrett, Luger and their buddy Don Callis grabbed the microphone and said that Styles wasn’t in the same league as Jarrett and Luger, until Sting grabbed the stick and said otherwise. When they finally got down to work only three of the four men involved looked good. Luger hadn’t had a match for nearly three years at this point and it told in this slow and plodding performance. The Total Package looked like he had a few items missing from his parcel. Styles was the punching bag in this match until he reversed Luger’s torture rack with the help of Sting and his baseball bat, getting the pin with a sunset flip. Definitely not one of TNA’s best moments. 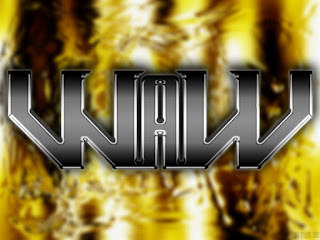 November 2003: A Fan’s Revenge match, with NWA World Champion Jeff Jarrett facing Dusty Rhodes for control of the company. It says a hell of a lot for Rhodes that despite being somewhat older than Luger his performance was far superior in every way. However, although the match was relatively well executed the ending kind of sucked, and I had no idea what the final decision was after Don Callis and Erik Watts tried to interfere, because that part wasn’t shown. August 2003: D-Lo Brown challenges A.J. Styles for the NWA World title in a steel cage match, with Director of Authority Erik Watts handcuffed to Vince Russo at ringside. This was a pretty good match, although there were a couple of fluffed moments early on. Both men shed blood for their cause here, and they kicked out of each other’s finisher before Brown decided he was going to have a Superfly moment by climbing to the top of the cage. But an altercation at ringside that saw Watts ram Russo into the cage sent Brown crashing to the mat, with Styles getting the three count moments later. February 2004: More tag team action as the Gathering, C.M. Punk and Julio Dinero, faced Terry Funk and Raven. This one had been building up for a few weeks. Raven had vanished after Punk and Dinero had turned on him, leaving Funk to face his former partners with various partners of his own. It’s an entertaining brawl which sees Funk getting busted open within seconds after a chair shot. It eventually settles down into a regular match, with Funk taking all the blows until he gets the hot tag. Raven then proceeded to clean house before taking Dinero out with the DDT. The Gathering’s manager James Mitchell then made an appearance with a stun gin, but he fails to find his original target as Funk takes the shot for Raven before all three heels run for cover. Despite their vast difference in size these two had great chemistry. Styles bumped like hell as the big guy tossed him around the ring. Abyss put in a couple of big bumps as well, including when he was on the receiving end of a sunset flip power bomb off the ladder and through a couple of chairs. Raven provided the moment of distraction as Styles was about to grab the contract, which gave Abyss the chance to push the ladder over, sending Styles crashing onto a ladder at ringside. Moments later the Monster scaled the ladder and grabbed the contract. April 2004: Sabu faces Monty Brown in a falls count anywhere match. I absolutely loved Monty Brown, one of my favourite TNA stars of all time. The guy just had that “it” factor, and I was disappointed that it didn’t work out for him in WWE. Sabu comes out with his usual stuff before they start brawling through the arena, and as they moved into the old S.E.X. locker room Abyss made an appearance, power bombing Sabu through a table before the mystery red headed woman appeared to calm him down. Then, after realising that the Monster wasn’t going to go after him Brown took Sabu down with the pounce for the winning pin. April 2004: Another cage match, with Jeff Jarrett defending the NWA World title against a mystery opponent, revealed as A.J. Styles. Lots of yakking at the beginning here as Director of Authority Vince Russo ran down his choices of opponent for Double J before finally announcing Styles. It’s a dramatic and intriguing back and forth affair, with Styles putting in an almost flawless performance, and Jarrett pulling out all of the old tricks, including using powder and a steel chain taken from within his boot. Not even the cage could contain them at one point, with Jarrett grabbing his faithful old guitar at one point. Styles managed to foil Jarrett’s Honkytonk Man though as he rolled Jarrett up for the title winning pin. June 2004: The first match of the collection in the six sided ring, with A.J. Styles challenging Frankie Kazarian for the X Division title. This was touted as Styles’ return to his roots after he won a four-way number one contenders match on the very first edition of Impact on Fox Sports. While this wasn’t the best X Division match I’ve seen it certainly was entertaining, and the six sided ring was perfect for a match of this kind. The proverbial knock down drag out affair some interesting spots, with Styles suplexing Kazarian from the ring apron to the floor - not one of those moves where he just kind of dropped Kazarian over his shoulder, but a full blown suplex, with both men taking a big bump from the ring post to the floor. A slightly screwy ending here though. Styles came off the top with the corkscrew and actually missed Kazarian. He then went for the pin, and Kazarian seemed to lift his shoulder before the ref counted three. The bell rang, and the announcers were confused until the referee raised Styles’ hand, giving him the title win. July 2004: Jeff Hardy’s first appearance on this collection, facing Monty Brown for a shot at the NWA World title. A relatively short match with Hardy spending as much time posing and pulling daft expressions as he did on offence as Brown dominated with his power. Jeff Jarrett made an appearance, pulling Brown out of the ring before Hardy got the pin with a roll-up. Well, it wasn’t bad, but it wasn’t exactly enthralling either. August 2004: Kid Kash takes on A.J. Styles in what is billed as an X Division street fight. This was one wild brawl that saw both men battling all over the Impact…I mean Asylum. There were slams and DDTs on the bleachers, and a crazy bump as both men dangled off a balcony before falling through a table, smashing through a table to the concrete floor. They eventually returned to the ring, with plenty of near falls and attempted interference from Lance “Dallas” Hoyt before Styles got the pin with a roll-up. September 2004: The final match of the collection, with Jeff Hardy challenging Jeff Jarrett for the NWA World title. Wild stuff at the beginning here. These two couldn’t wait for Jeremy Borash’s introductions, with security having to pull them apart several times, the pre-match brawling resulting in Jarrett getting busted open before the opening bell. The brawling continued throughout the building, with both men threatening to throw the other over the balcony at one point. Seconds later Jarrett clobbered the referee with a chair shot that was meant for Hardy. They soon returned to the ring, and as Monty Brown, Abyss and Raven watched on from the distance they kicked out of each other’s finisher. Dusty Rhodes then came down to the ring and gave Hardy a helping hand before Vince Russo stopped his interference, and after all of this Jarrett gained the win after clobbering Hardy with his trusty old guitar. Not bad, and certainly better than Hardy’s match against Brown. April 2004: Sabu takes on the monster Abyss. I think you can guess what I was expecting from these two. Lots of brawling, lots of chair use and Sabu leg dropping Abyss through a table, as well as an appearance from the Monster’s lady friend Goldilocks. Then, another somewhat confusing ending, with Abyss getting disqualified for pushing the referee. So I guess using a chair was okay then! June 2004: Monty Brown and Abyss challenge America’s Most Wanted for the NWA World Tag Team titles. Goldilocks’ hybrid power team looked good early on as they took James Storm and Chris Harris apart. But despite the power advantage the experience of AMU came to fore as the looked like they were ready to take the win after Storm took Abyss down with a super kick before Harris connected with a spear. AMW got the win, but not by pin as the Naturals hit the ring and attacked them, with the referee disqualifying Brown and Abyss. A very enjoyable match. June 2004: A.J. Styles defends the X Division against a mystery opponent, who turns out to be the debuting Jeff Hardy. The crowd were absolutely wild throughout this match, but despite the pedigree of those involved and the potential for a five star classic they weren’t actually given much time. It was a great match though, until Kid Kash and Dallas ran in and attacked Styles, with both men sending the cowardly heels running for cover. July 2004: The battle of the Browns, with Monty taking on D-Lo. Billed as a grudge match this was another of those affairs that took in the entire Asylum as they brawled around the building. It was okay and in it’s way, but hardly the best I’ve ever seen. Monty took the win after taking D-Lo down with the pounce through a table. In conclusion - while it’s nice to see TNA looking back at it’s formative years this release is a bit of a hit and miss affair. There’s some great matches on here, but there are also some less than exceptional outings. Shamrock/Sabu was only included because it was the first Asylum main event, while the tag match involving Sting and Luger probably only made it because it involved Sting and Luger, and not because of it’s match quality. Then there’s the over-booked and screwy endings that spoiled what could have been tremendous matches, Jarrett/Raven and Styles/Hardy being good examples of this. But overall the majority of the action is good, and those who have followed TNA since day 1 will probably want to add this to their collection. With thanks to the powers that be at TNA for supplying a copy of this release.